Refreshing Watermelon Mint Agua Fresca is the perfect spring or summer beverage. It's made with just a few simple ingredients, and can be served nonalcoholic or made into a cocktail. In a small pot, bring water to a boil. Add the mint leaves and sugar. Stir until the sugar has dissolved. Transfer to a heatproof container and let chill, uncovered, for about 30 minutes. Strain into a bowl and discard the mint leaves. In a blender, combine the mint syrup, watermelon and lime juice. Blend until very smooth and strain into a pitcher. Add 2 cups of water and stir. Pour over ice and garnish with a fresh mint sprig. 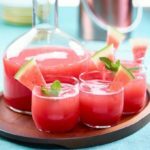 To make this watermelon agua fresca into a cocktail, add vodka and serve in a martini glass. You may substitute honeydew or cantaloupe for the watermelon if desired.